Coming off a loss in which they were out played thoroughly the Liberty looked to regain their winning ways at home on the Garden floor. They hosted the surging Phoenix Mercury, whose duo of Brittney Griner and Diana Tuarasi are fresh off big performances in the Olympics. The Mercury were 4-2 in their last six games however they lost their last game to the Connecticut Sun. The Liberty have their own Olympian in Tina Charles who was also looking to regain her pre Olympic form on the court. Before the game all three Olympians were honored before the crowd. After the tough loss against the Fever, veteran forward Swin Cash said that the team needed to play tougher and come out with more energy. 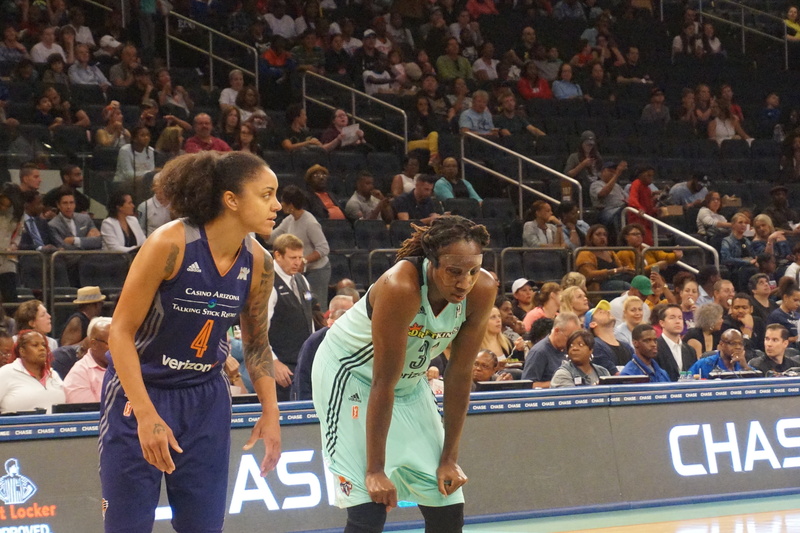 “She has really found her voice with her team…” –Swin Cash on the growth of Tina Charles. Before the game Phoenix veteran guard Penny Taylor announced her retirement after many years at the helm of the Mercury attack. She had 9-points at the half on 4-9 shooting. She has been a member of the Mercury since 2004 and had a successful 12-year career in the WNBA. The game started off slowly for both teams as they struggled to find the basket early. Tina Charles however picked up the scoring early for the home team. She had 19 –points in the first half and led the Liberty to a big lead. Tina also hit a milestone today, as she became the 29th player in league history to score 4000 points for her career. They led by 15-points at various points during the second quarter. The Liberty shot 48% from the floor during the first half and shot 60% from behind the arc, as they were hot after the slow start to the game. At the end of the first half the Liberty led 48-34. Brittney Griner was in foul trouble early as she picked up 3 fouls early and had to sit for most of the second quarter. Diana Tuarasi also struggled from the floor. She had 8-points at the half and didn’t seem like she was in a good rhythm for the first half of the game. She showed her frustration at the end of the half as she tossed the ball at the basket after the first half horn but it went astray and into the crowd. She shot 2-7 and just could not get a rhythm. Candice Dupree was held scoreless in the first half as well for the visiting team. The Liberty opened up the second half with a jumper by Rebecca Allen and a tough and-one layup by Brittany Boyd. She followed that up with another layup on a fast break and gave the Liberty a 54-36 lead as they looked to open up a huge lead and close this game out early. Sugar Rodgers had a productive game as well especially from behind the arc. Brittney Griner picked up her 4th foul with 5:13 left in the 3rd and once again had to be regulated to the bench for an extended time. Things got testy in the 3rd quarter; the Liberty extended their lead however Diana Tuarasi picked up a technical after she did not get a call. Assistant Coach Todd Troxel (Mercury) was also assessed a technical foul and was ejected from the game. The Mercury responded with a run and cut the lead to 12 with 8:54 left in the 4th period. Brittany Boyd brought the Liberty crowd alive with a Euro-Step with 6:05 left in the 4th. Even Tina had to show her dance moves after the play as she stayed down court and mimicked the move after the Mercury called a time out. The Liberty won the game 90-72; the contributions came for everywhere as there were 3 players in double figures, Charles, Boyd and Rodgers all played well on the offensive end of the floor. Shavonte Zellous chipped in with 8 points off the bench and made plays all over the court for the Liberty, she added 3 steals and 4 assists. Diana Tuarasi was held to 10-points and sat for most of the 4th period as the game was already out of reach. She was uncharacteristically inconsistent as she shot 3-11 and seemed to be chatting often with the referees after non-calls and other plays. Griner was ineffective, she had only 2-points and was in foul trouble throughout the game. She was never able to really get into a rhythm. Tina’s dominance in the first half shows just how good she can be when she is aggressive. After the loss to Indiana she felt that she needed to come out strong to lead the team. Coach Laimbeer echoed some of those thoughts; he spoke about how dominant Tina can be and how she should be on a nightly basis. She has improved her offensive production in every season since she has been in the league. Tina has been in MVP conversation since the early portion of the season and the Liberty continue to lead the Eastern Conference. Tina finished the night with 23-points and 15 rebounds. The Liberty’s next game is Wednesday September 7th as they take on the Seattle Storm at home.